Nothing will do more for your speed than an optimal bike fit that gives you the “Big Three”: AERODYNAMICS, POWER and COMFORT – not just one or two. But how do you know if YOUR bike fit is optimal? Whether you are just getting started, or you are a seasoned veteran, you can benefit from bike fit analysis. Lots of athletes assume that a flat aero position requires extreme flexibility and core strength, and is something only elites can achieve. WRONG! If you’ve had back or shoulder problems that you attribute to being “too low”, chances are it had nothing to do with the degree of “lowness”, but was caused by a too-narrow hip angle and/or a too-long cockpit. You cannot simply change one thing on an aero bike and assume you are fit properly – everything interacts: drop, seat angle, seat height, and reach. Without a biomechanical bike fit analysis you are shooting in the dark. We find again and again that our clients are MORE COMFORTABLE, MORE POWERFUL, and MORE AERO. We are the original digital bike fit experts for anyone who races against the clock. Aero-position bike fit is totally different than standard road bike fit. Bike fit formulas based on static measures of body dimensions are not sufficient to find a good aero position. Only body angle analysis can tell the whole story, and the best way to do that is to measure angles under load and in-motion, not in a posed state. Our bike fit protocol also works great for road bike fits! We can make sure that your body is tracking through the same angles exhibited by the world’s top professional road racers. Best of all, if you don’t live somehwere near Rhode Island, we can do your bike fit online for a very reasonable price. Until now, most people didn’t have access to an experienced bike fitter that specializes in aero positioning. Now everyone does! WE RACE, just like you. We’ve been racing triatlons and time trials for 16 years, from sprint to Ironman distance. We’ve made the mistakes, figured out the solutions, and now we can pass them on to you. 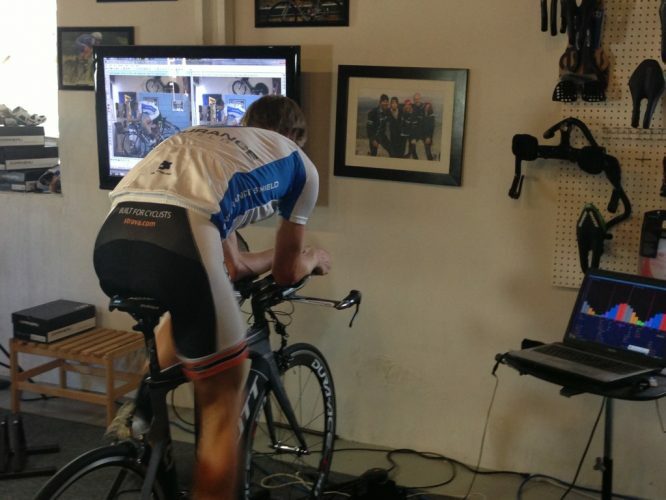 Why Should YOU Get a TT Bike Fit? Great question. And here’s the great answer: Nothing will shave more time off your bike split than an aero, comfortable position. There was a great article on Cervelo’s site about bicycle aerodynamics. The quick summary is that for a 40k race, an aero position (ideally a horizontal torso) can save you 6 minutes, while aero wheels might save 1-2 minutes and an aero frame 1 minute (note that these are not all additive). Clearly, a good aero fit is the most cost-effective way to speed up your bike split. Now, you probably had some type of bike fit at the local bike shop when you bought your bike. If you ride a road bike in a standard road position, obtaining a halfway decent fit is relatively straight forward. Measure inseam, set seat height, drop a plumb line from the knee to pedal spindle, check reach. Or, maybe you did a fit kit or another system where knee angle was measured. This will all work generally fine for a road position, and this is all most bike shops know how to do. If you have not been fit by an aero fit specialist, you are probably set up wrong, maybe grossly so. Also note that just because someone has the latest “Laser-fit-o-rama 2000” fit tool, it doesn’t mean they have the slightest clue about bike fit. All I have to do is look around at a group ride or in the transition area of any tri, and I see alot of awful setups. The simple fact is this: aero position is a whole different enchilada. There is a lot more to it than slapping a pair of aerobars on your road bike. Ideally you want a fairly horizontal torso which requires a lower front end. Many people equate such a position with PAIN, and for good reason – an aero position will be as uncomfortable as heck unless done properly. It really is possible to be aero, comfortable, and powerful, but you must adjust everything: seat height, seat angle, front end height, reach, etc. We don’t believe it is possible to just eyeball your position and achieve fit nirvana. It must be measured accurately, and we don’t think that static measures using goniometers and similar devices tell the whole story. Aero-specific fit. We know how to fit aero. Many “fit systems” fail to distinguish between road and aero fitting – big mistake! We are NOT certified by anybody. Why? Because we developed our OWN system through many years of testing and study that has proven itself among pros and elite amateurs time and time again. Yet it works great for beginners too. We use dynamic analysis of you pedaling under load, as opposed to static measurement which may not accurately depict your position. We use software to plot your angles while you are working, instead of measuring angles with a device while you are stopped. Angle measuring devices are prone to error, and again they are unable to take measurements while you are moving. We can fit you on your own bike of course. However, fit bike fittings certainly have some advantages – they are great for finding a “perfect” position without being limited by a particular bike. If you have a bike that is wrong for you, or you are looking to move from an entry level ride to that dream-machine, a fit bike session will take the guesswork out of the process. Our own revolutionary new PATENTED Vertex Fit Cycle has been in use in our Lab for almost 5 years now, and we continue to add to its capabilities. Because our fitbike can change all your fit parameters while you are pedaling under load, you can immediately feel the effect of changes, and we can immediately see (and analyze with motion analysis and Spin Scan) what the changes do to your body and pedal stroke. We can repeatedly take all your fit parameters back and forth until we zero in on that perfect fit. WE will also investigate cranks length changes using the on-board Vari-Crank. Then we use our proprietary calculators to give you a list of frames that will work well for you. Or, we can calculate exactly what adjustments are needed to match your current bike to the fitbike coordinates. WE have proprietary calculators for configuring all the superbikes. Since many of these are hugely painful to adjust, it is great to know what needs to be done BEFORE wrenching! If you’re considering a new bike, talk to us first! We are about fit first and UNBIASED advice – just ask anyone who has used our pre-buy services. We can tell you what specific frames and sizes will work for you, and discuss the pros and cons of just about anything out there. Yes we do now sell bikes – Blue, Fuji, Kestrel, Falco, Argon 18, and Louis Garneau – but we will ALWAYS provide you with a list of ALL bikes that could work for you, and we will NEVER recommend a bike that is wrong for you just to make a sale. We have very little floor inventory so we have no incentive to try to squeeze you onto whatever bike we are trying to get rid of! SO STOP GUESSING, GET FIT, and START HAMMERING THE COMPETITION!